So now you have been brewing All Grain for a while, and you want to be able to accomplish more with your hobby. Maybe you'd like to make brewday run smoother, quicker, or be able to repeatedly brew the same beer. The following equipment can accomplish all that, and more! 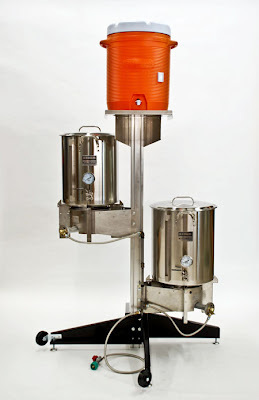 Brewstands - A brewstand is any contraption that holds your kettle, mash tun and hot liquour tank. Brewstands can be tiered, with different heights allowing for gravity to do the work in moving the liquid wort from vessel to vessel. Brewstands can also house all vessel at one height and utilize electronic pumps to move the liquid. Or a brewstand can be a combo of both. These stands can be made of wood or metal. They can come apart of they can be fairly static in their assembly. There are a lot of options, but they all provide a centralized "Brewery" and can house equipment. This can help a brewer because they won't have to carry all their equipment and setup every brewday. A portion of it will be done already. Pumps - 5 gallons of boiling liquid can be a tricky thing to move around. A lot of brewers utilize magnetic drive pumps like the March 809 to accomplish this. These pumps are especially handy if you start to make batches in quantities larger than 5. As mentioned earlier, pumps allow a brewer to keep their brewing vessels at the same height. A disadvantage to a gravity fed system is the brewer needs to be able to reach the top most point (with a ladder), which is usually the hot liquor tank to fill it. A Pump can alleviate these problems. Another use of a pump is recirculating during the mash, which is used on certain systems, or recirculating after a boil which creates a whirlpool effect. Currently, I don't have a pump and I have to slowly stir my wort to maximize contact with the wort chiller when cooling my wort. If I had a pump I could let it stir the wort while I clean or get fermenters ready. RIMS - A RIMS system applies heat to wort as it is recirculated. The heat is provide either through pumping the wort into another vessel where a burner heats up the liquid (Direct Fired RIMS) or the wort is passed through a tube containing a heating element. In most RIMS systems a pump is used for the entirety of the mash and the heat application is only applied when the temperature drops below the set range. HERMS - A HERMS system recirculates the wort through a heater exchanger, such as a copper or stainless pipe which is submerged in Hot water. A temperature controller is also used in this scenario to determine if more heat needs to be applied to the water of the containing vessel. These systems also allow for a brewer to do different temperature rests in a mash with ease. A brewer can to a rest at 144, ramp up to 156 and then perform a mashout to bring the temp to 168. This is all done by the RIMS or HERMS and setting the temperature controller. This will also allow a brewer to reach their desired rest temperature every time, which will produce a more consistent product. Odds and Ends - Generally a brewer will update their system with bits and pieces here and there. Some will eventually save their hard-earned money for a completely new build, leaving the ole faithful in the dust. Others will keep doing what they have been doing for years with the "if it aint broke, don't fix it" approach. It all depends on the brewer and their objects for the hobby. I am working and saving towards making a brewstand that will allow me to add on here and there with the ultimate goal to make beer quicker and more consistently.